The design for the proposed Commercial Technology Center (CTC) consists of a vast and functionally flexible hall between simple linear forms. This hall is populated with an unrelenting structural grid that allows for flexible space usage depending on need. Though enclosed at one end by the commercial office function, both ends of the structure are glazed and visually open, allowing the internal functions of the building to visually interact and demonstrate the interdependence of each function: office, education/training, research, idea incubation and shipping logistics within the complete business continuum. 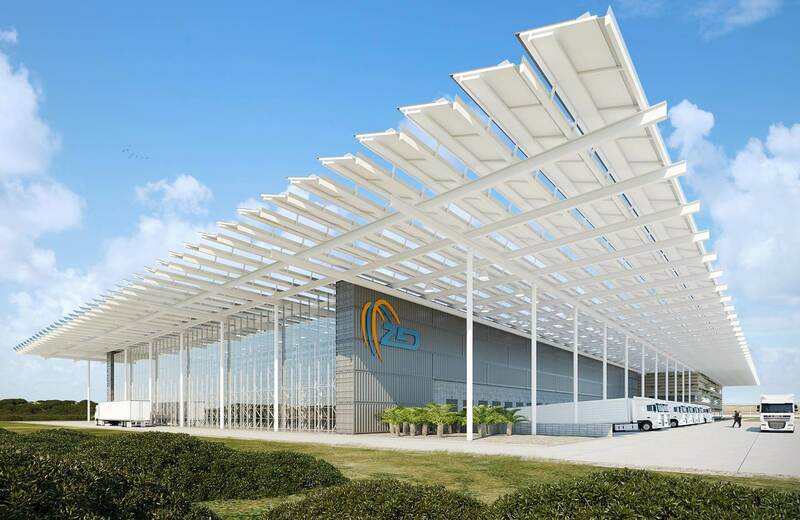 Leveraging the site’s climate and its abundant solar resources, the CTC is designed to create its own power through a rooftop solar array that achieves the Net Zero design standard. By scaling the magnitude of the array to its maximum, the resulting solar umbrella is capable of generating 3.2 megawatts of power each hour: estimated energy consumption for the CTC is approximately 4,650,000 Kwh per year, creating 9,300,000 kWh of surplus energy available for use by other developments within ZED Mariel.